^^ that was one way but again im not sure if it works^^ (another rumor down)DOESNT WORK!!!!!!!!! 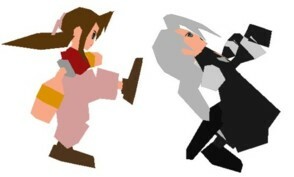 Need:Bahamut Zero, Cid in your party and another person who was in your party at the time of Aeris's death. Go to the traveller in Kalm. He'll ask you to find the Earth Harp, Desert Rose, and a Guidebook for him. Get the items listed in order [as just mentioned],and give them to the man in the same order. To get the Earth Harp, defeat Emerald Weapon. To get the Desert Rose, defeat Ruby Weapon. To get the Guidebook, go to the underwater tunnel in Junon, and run around until you see a skeleton ghostship, and morph it [with your Morph materia. But you don't have to morph it all the way...attack a few times.. (i suggest u sense it so you don't kill the thing. The MOST easiest item to get, but you gotta get it last. Now, go back to Kalm and give the items to the man in the right order (Earth Harp, Desert Rose, Guidebook). He'd be really thankful, and gives you a Gold Chocobo. Along with that, he'll give you Materias, ALL Mastered, and the Underwater Materia. Equip the Underwater Materia on Cloud, and get to the City of the Ancients with the Gold Chocobo. "Visit" Aeris' burial, and into the shell house. "Mr. Fish" will be there, and you will be able to talk to it. It'll then let you pass, cuz you have the Underwater Materia. Next, go around the altar where Aeris died, and Cloud would break down.. Cid will come out and comfort him, while the other will be questioning about the White Materia. Mr Cid will next see something shining in the water, dives for it, and comes up with an "Aeris Revival Materia". But that's not all... Equip it with Bahamut Zero, then it'll take you to Aeris... and that's all i know... ((((that was another but again not sure)))))DOESNT WORK!!!! Before Mideel blows up you, get 100 tissues at the Battle Arena at Gold Saucer. Then go to Mideel and talk to the woman on the very left (or somewhere near there). She should br crying and then she uses all your tissues, then she thanks you and tells you the secret to reviving Aeris. Ok there were some ways to try im not sure about any of them but please try and post so i no if they work or not............DONT WORK THERE ISNT EVEN A LADY?